After days of rainfall pummeling the coasts of California now it’s boxing’s turn to take a few swings of its own. In three days five fully loaded fight cards take place mostly in Southern California with the Sunday punch erupting in Northern California. 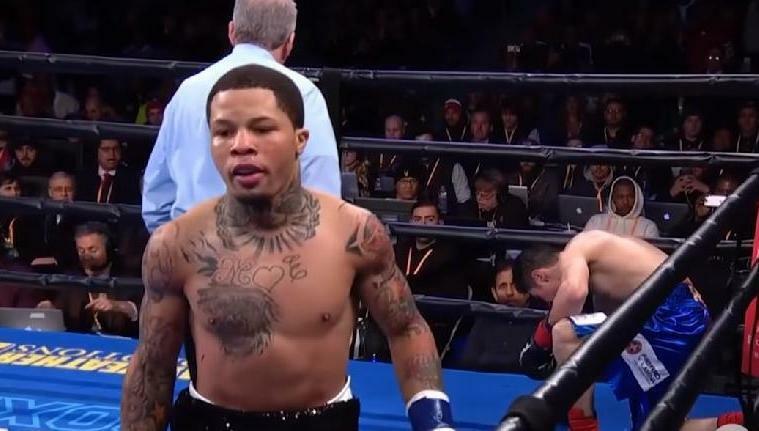 Those who love boxing may never be the same again with Gervonta Davis, Alberto Machado and Jose Carlos Ramirez coming through the pike. 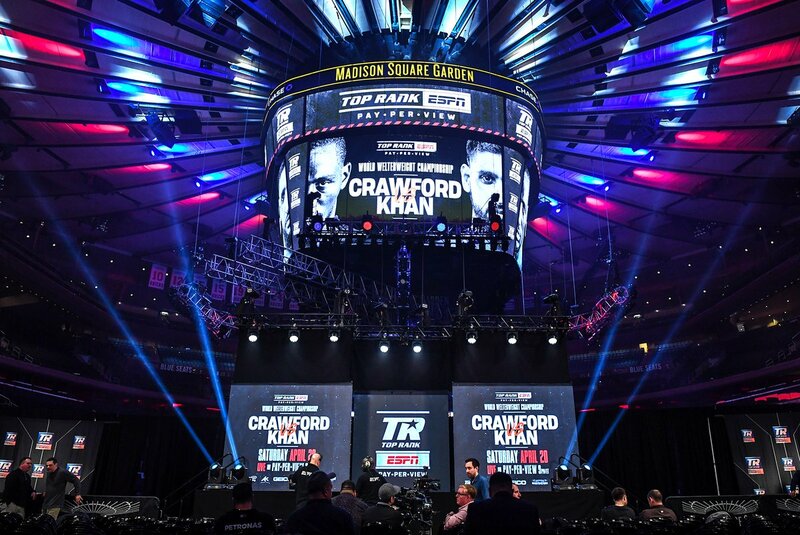 From small promotion powerhouses like Thompson Boxing Promotions to older established mega monster outfits like Top Rank, fans in the Golden State will be able to watch world title fights, classic clashes and good old fashion club fights from Friday to Sunday on television, streaming or in person. On Friday, Feb. 8, Thompson Boxing brings its usual impressive array of prospects to the Doubletree Hotel in Ontario, Calif. 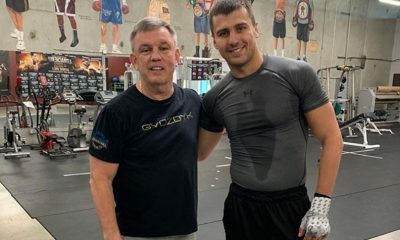 The boxing company that introduced Timothy Bradley, Josesito Lopez, current world champion Danny Roman and many others will be showcasing several new prospects. Over the years matchmaker Alex Camponovo has shown a keen eye in picking prospects from the pile. Who will emerge as its next star? Bantamweights clash in the main event with Mario Hernandez (8-0-1, 3 KOs) facing Luis Saavedra (7-6, 3 KOs) in an eight round contest. Several other solid matchups are planned. Doors open at 7 p.m. and action starts at 8 p.m. For tickets and information call (714) 935-0900. The fight card can also be seen via stream on Thompson Boxing Promotions page on Facebook. Commentating for the first time will be Doug Fischer who replaces Steve Kim. Remaining as a lead commentator is Beto Duran. 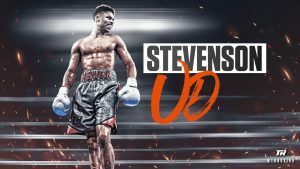 On Saturday Feb. 9, Golden Boy Promotions presents possibly its best boxing card in years though many may not see it that way. Top to bottom the lineup led by WBA super featherweight titlist Alberto “Explosivo” Machado (21-0, 17 KOs) defending against Andrew Cancio (19-4-2, 14 KOs) promises to be riveting at Fantasy Springs Casino in Indio, Calif.
And it should be. All of the cards will be streamed by DAZN and it’s in a battle for boxing relevancy with Showtime, Fox and ESPN. Nothing less than excellence will ensure its survival. 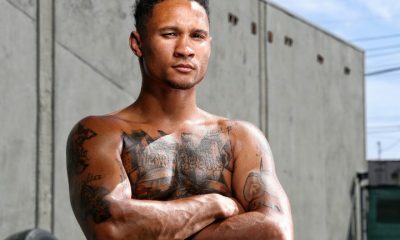 Facing Machado (pictured on the left) will be Blythe, California’ s Cancio who’s known for giving any aspiring superstar a run for their money. Many a title challenger has been toppled by Cancio who is like an NFL safety making a shoestring tackle on a running back heading for daylight. If you don’t have the goods Cancio will let you know. 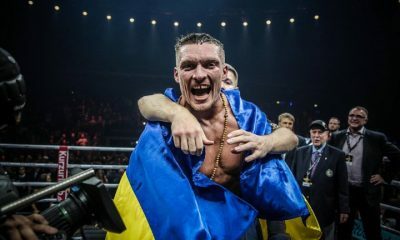 It was the fight against Zenunaj that caught the attention of fans as the two super featherweights put on a performance that many claim was the true “Fight of the Year.” It caught many by surprise at the ferocity both fighters showed that summer night last August. Zenunaj is another fighter that should be brought back but that’s a topic for another time. Hopefully we see Zenunaj again. 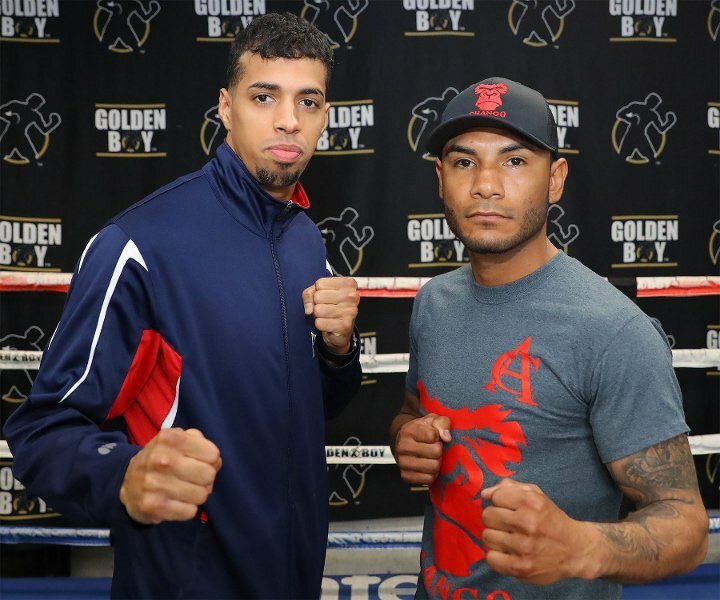 On Saturday, Cancio expects Puerto Rico’s Machado to come out blasting. Another world title fight matches WBC super bantamweight Rey Vargas (32-0, 22 KOs) a tall, long and angular fighter from Mexico City who has made three world title defenses since snatching it away from Britain’s Gavin McDonnell in England two years ago. Venezuela’s Franklin Manzanilla (18-4, 17 KOs) gets his crack at Vargas and has that hunger you can’t teach. Manzanilla is making his first visit to the USA and says his family and friends in Colombia and Venezuela are ecstatic about his opportunity. A third marquee fight features featherweight title contender Jojo Diaz (27-1, 14 KOs) facing local legend Charles Huerta (20-5, 12 KOs) in a fight set at 130 pounds instead of 126. Could the difference in weight make a difference? Huerta, now 32, has a vast amount of experience that he can unfurl on any fighter regardless of talent. One major question mark is rust. He suffered an Achilles Heel injury and was inactive for more than a year. But he’s one of the most intelligent fighters in boxing crazy Southern California and can topple anybody on any day. Back in the 1980s this type of fight between Southern California hotshots would have sold out the Olympic Auditorium. Expect fans of both fighters to travel 100 miles to see this fight at Fantasy Springs Casino. Huerta and Diaz are not the only Southern California rival fight. 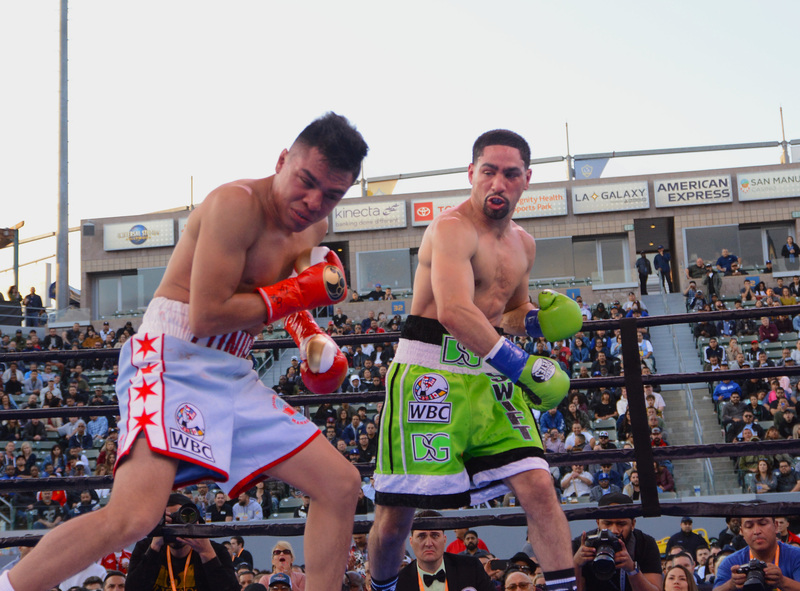 A pair of lightweights are set to clash with San Diego’s undefeated Genaro Gamez (8-0) meeting L.A.’s Ivan Delgado (13-1-2) in an eight round contest. I guarantee this fight will light it up. Five other bouts are scheduled including Armenian warriors Ferdinand Kerobyan and Azat Hovhannisyan in separate bouts. Plus, Durango’s Oscar Duarte and Coachella’s Rommel Caballero in two other separate bouts. Middleweight contender Tureano Johnson is also scheduled to fight on the ultra-stacked boxing card. It’s absolutely the best boxing card Golden Boy has staged in years from top to bottom. 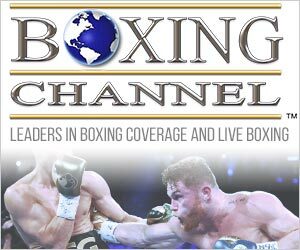 If you can’t make it to Indio you can view the boxing card via DAZN.com. WBA super featherweight southpaw slugger Gervonta Davis (20-0, 19 KOs) defends his world title against last-minute replacement Hugo Ruiz (39-4, 33 KOs) on Saturday Feb. 9, at the Dignity Health Sports Park (formerly StubHub Center) in Carson, Calif.
Davis was slated to face Abner Mares in a top notch matchup but an eye injury forced a cancellation. Now, Ruiz, fought last month in Las Vegas and won by decision against Alberto Guevara, is the replacement opponent for the mighty Davis. It’s just one of those quirks of fate that happens in boxing. Ruiz knows what to expect. “I think this is going to be an explosive fight. We’re both known for our knockouts and this is a fight that can end at any moment. It’s going to be by a knockout,” said Ruiz of Mexico. Another fighter to watch is Mario Barrios. The undefeated Barrios (22-0, 14 KOs) meets Mexico’s Ricardo Zamora (19-2, 12 KOs) in a 10 round super lightweight clash. It’s another step-up fight for the 23-year-old from San Antonio, Texas. 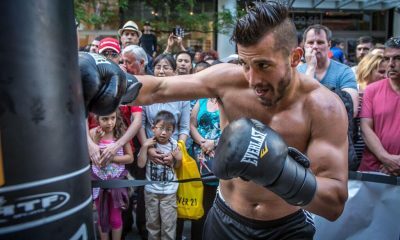 Last summer, Barrios clipped Jose Roman in a similar battle for legitimacy as a contender. Super bantamweights Humberto Rubalcava (9-0) and Jonathan Torres (8-6-1) clash in the main event on Saturday Feb. 9, at Gardens Casino in Hawaiian Gardens, Calif. The fight card is promoted by Englebrecht Events and features several local fighters. Doors open at 6 p.m. For more information call (949) 760-3131. 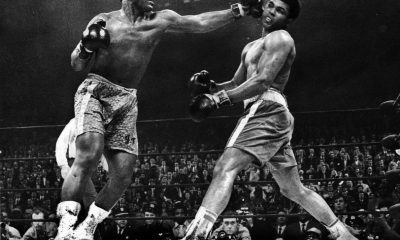 Because of the Saturday afternoon crush of fights Top Rank pushed its boxing card to Sunday afternoon where the sports calendar is free especially now with NFL football finished. WBC super lightweight titlist Jose Carlos Ramirez (23-0, 16 KOs) defends against Jose Zepeda (30-1, 25 KOs) in the main event at Save Mart Arena in Fresno, Calif. ESPN will televise. 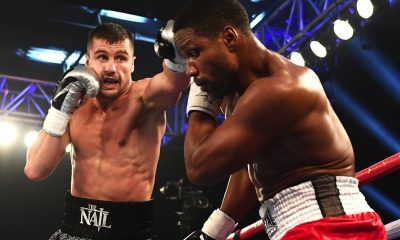 Ramirez, 26, is making his second defense of the world title since winning it nearly a year ago in March 2018 against Amir Imam. His last fight was a firefight against Antonio Orozco that ended in a unanimous decision win. But for 12 rounds the two fired relentlessly nonstop. 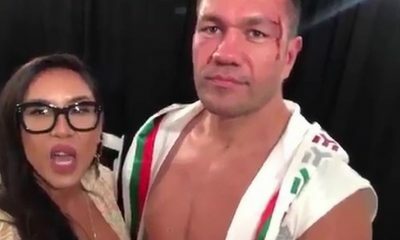 It was a riveting performance and considered one of the top fights of 2018. Ramirez also has dedicated his fight toward the war against cancer and will be donating part of his boxing wardrobe for an auction. The proceeds will go toward the local Community Cancer outreach. Zepeda, 29, is a southpaw knockout puncher who has been around the Southern California fight scene for a while. He always presents a danger. “I can’t underestimate Zepeda especially because he’s a lefty,” said Ramirez who trains with Robert Garcia in Riverside, Calif.
Also on the fight card is former champion Ray Beltran (35-8-1) who meets Japan’s Hiroki Okada (19-0) in a super lightweight contest in the semi-main event. Saul Rodriguez, the super featherweight prospect out of Riverside, has his second fight under the Top Rank banner since returning. His next foe is a Brazilian knockout artist named Aelio Mesquita. Rodriguez (22-0-1, 16 KOs) meets Mesquita (17-3, 15 KOs) in a 10 round contest at the lightweight limit. Both are hard-hitting fighters with speed. 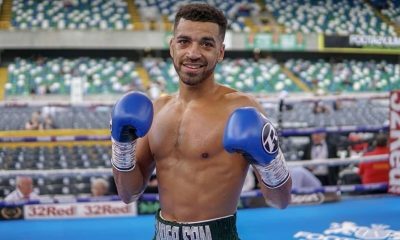 Mesquita has faced Shakur Stevenson and was stopped in two rounds. It’s an important test for Rodriguez who was among the top prospects before signing with Mayweather Promotions more than two years ago. But an inability to place Rodriguez in marquee fights forced the California fighter to return to Top Rank. Now he’s poised to break into contender status. This is step number two for Rodriguez. ESPN will televise some of the fights and ESPN+ will stream the other fights on the streaming service. First streamed bout begins at 1 p.m. PT.